A category four geomagnetic storm is sweeping over the Earth today, and while that means all sorts of funky things for power and communications systems, it should also cause some seriously incredible lights in the sky. The storm is caused by a solar flare emitted this afternoon, as captured below by NASA’s Solar Dynamics Observatory. The geomagentic storm is classified as G4, the second-highest possible severity on a five-point scale. The last G4 storm happened back in March, when the aurora’s haunting green lights were seen as far south as New Mexico. The NOAA’s space weather prediction center publishes a forecast of your chances of seeing the aurora; as ever, your best chance is to try and go somewhere with minimal light pollution, the more northern the better. 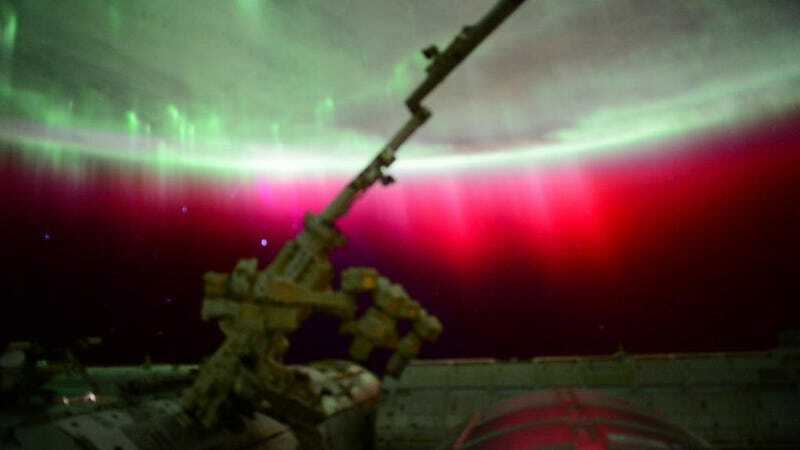 If you manage to catch a glimpse, though, the results could be impressive: Astronaut Scott Kelly on the ISS has already tweeted a photo of the red aurora visible from the ISS.